Lots of effort goes into giving gifts this time of year—with so many holidays right around the corner and so many people eager to celebrate, the energy is charged in the winter air and everyone is out and about. People spend lots of time, thought, effort, (and typically money) on the things that they gift to one another. After all, when the time comes for gift opening, we want that moment to be just right. Things don’t always go the way we had planned, though. Late deliveries are crummy but they happen—even when you’ve done everything in your power to make sure it arrives on time. We appreciate the importance of gift-giving here at Everything Summer Camp and we want to help make sure that your gifting goes off without a hitch this holiday season. When you order from Everything Summer Camp, you can rest assured that your delivery will be on time; we want your gift-giving to go just the way you have it planned out. That’s why I’m calling your attention to our handy holiday map. 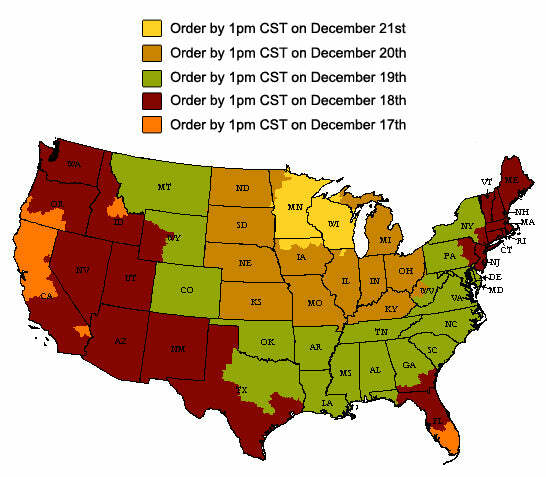 This helpful, color-coded map eliminates any confusion about how early you need to place your order on our website so it ships to you on time. Of course, delivery times differ throughout the country. But, personally, I don’t like procrastinating, so I like to urge people to order as early as they can—better safe than sorry! That’s why I’m sharing the magic numbers of 1:00pm on December 17. That’s the time and date for everyone in the contiguous United States to go off of for guaranteed delivery by December 24. December 17 may be early for some of you; Everything Summer Camp is based in northwestern Wisconsin, so if you live in Wisconsin, most parts of Minnesota, or another nearby area, you have the luxury of placing your order as late as 1:00pm on December 21. Happy holidays, Everybody! As always, thanks for reading!